M. Levene, T. Fenner, G. Loizou and R. Wheeldon A stochastic model for the evolution of the web. Computer Networks, 39, (2002), 277-287. T. Fenner, M. Levene and G. Loizou. A stochastic evolutionary model exhibiting power-law behaviour with an exponential cutoff,cond-mat/0209463. Physica A, 335 (2005), pp. 641-656. T. Fenner, M. Levene and G. Loizou. A stochastic model for the evolution of the web allowing link deletion. cond-mat/0304316. ACM Transaction on Internet Technology, 6, (2006), 117-130. T. Fenner, M. Levene and G. Loizou. A model for collaboration networks giving rise to a power law distribution with an exponential cutoff, physics/0503184. Social Networks, 29, (2007), 70-80. T. Fenner, M. Levene, G. Loizou and G. Roussos. A stochastic evolutionary growth model for social networks. physics/0607188. Computer Networks, 51, pp. 4586-4595, (2007). T. Fenner, M. Levene and G. Loizou. Predicting the long tail of book sales: Unearthing the power-law exponent. Physica A, 389, (2010), 2416-2421. T. Fenner, M. Levene and G. Loizou, A Discrete Evolutionary Model for Chess Players' Ratings. arXiv:1103.1530v1[physics.soc-ph]. IEEE Transactions on Computational Intelligence and AI in Games, 4, (2012), 84-93. T. Fenner, M. Levene and G. Loizou, A bi-logistic growth model for conference registration with an early bird deadline, Central European Journal of Physics, July 2013. T. Fenner, M. Levene and G. Loizou, A stochastic evolutionary model for survival dynamics. arXiv:1401.5957[physics.soc-ph]. Physica A, 410, (2014), 595-600. T. Fenner, M. Levene and G. Loizou, A stochastic evolutionary model for capturing human dynamics. arXiv:1502.07588 [physics.soc-ph]. Journal of Statistical Mechanics: Theory and Experiment (JSTAT) August 2015, P08015. T. Fenner, M. Levene and G. Loizou, A stochastic evolutionary model generating a mixture of exponential distributions. arXiv:1511.08712 [physics.soc-ph]. European Physical Journal B (EPJB), February 2016, 89:50. M. Zhitomirsky-Geffet ,J. Bar-Ilan and M. Levene, A Markov chain model for changes in users’ assessment of search results. PLoS ONE 11(5): e0155285, 2016. T. Fenner, E. Kaufmann, M. Levene and G. Loizou, A multiplicative process for generating a beta-like survival function with application to the UK 2016 EU referendum results. arXiv:1703.10548 [physics.soc-ph]. International Journal of Modern Physics C, 2017. T. Fenner, M. Levene and G. Loizou, A multiplicative process for generating the rank-order distribution of UK election results. arXiv:1609.04282 [physics.soc-ph]. Quantity & Quality, 52, (2018), 1069-1079. T. Fenner, M. Levene and G. Loizou, A stochastic differential equation approach to the analysis of the UK 2016 EU referendum polls. Journal of Physics Communications, ,2 055022, 2018. T. Fenner, M. Harris, M. Levene, and J. Bar-Ilan, A novel bibliometric index with a simple geometric interpretation. PLoS ONE 13(7): e0200098, 2018. Birkbeck team devises a new method to measure research impact. M. Levene, and A. Kononovicius, Empirical Survival Jensen-Shannon Divergence as a Goodness-of-Fit Measure for Maximum Likelihood Estimation and Curve Fitting. arXiv:1809.11052 [stat.ME]. P. De Meo, M. Levene, F. Messina and A. Provetti, Computing a score of navigability in large graphs. arXiv:1812.08012 [cs.SI]. A. Mudinas, D. Zhang and M. Levene. Bootstrap domain-specific sentiment classifiers from unlabeled corpora. Transactions of the Association for Computational Linguistics, Vol 6, 2018. M. Levene and G. Loizou Navigation in Hypertext is easy only sometimes. SIAM Journal on Computing, 29, (1999), 728-760. M. Levene and G. Loizou A probabilistic approach to navigation in Hypertext. Information Sciences, 114, (1999), 165-186. M. Levene and G. Loizou Computing the entropy of user navigation in the web. International Journal of Information Technology and Decision Making, 2, (2003), 459-476. J. Borges and M. Levene Data mining of user navigation patterns. In Web Usage Analysis and User Profiling, pp. 92-111. Published by Springer-Verlag as Lecture Notes in Computer Science, Vol. 1836, 1999. N. Zin and M. Levene Constructing web views from automated navigation sessions. In ACM Digital Library Workshop on Organizing Web Space (WOWS), Berkeley, Ca., August, pp. 54-58, 1999. M. Levene The navigation problem in the World-Wide-Web. Invited talk, delivered at the 24th Annual Conference of the German Classification Society, Passau, March, pp. 289-297, 2000. M. Levene and G. Loizou Web interaction and the navigation problem in hypertext. Encyclopedia of Microcomputers, Vol. 28, Supplement 7, Marcel Dekker, New York, pp. 381-398, 2002. M. Levene and G. Loizou Zipf's law for web surfers. Knowledge and Information Systems an International Journal, 3, (2001), 120-129. M. Levene and G. Loizou Kemeny's constant and the random surfer. American Mathemtical Monthly, 109, (2002), 741-745. 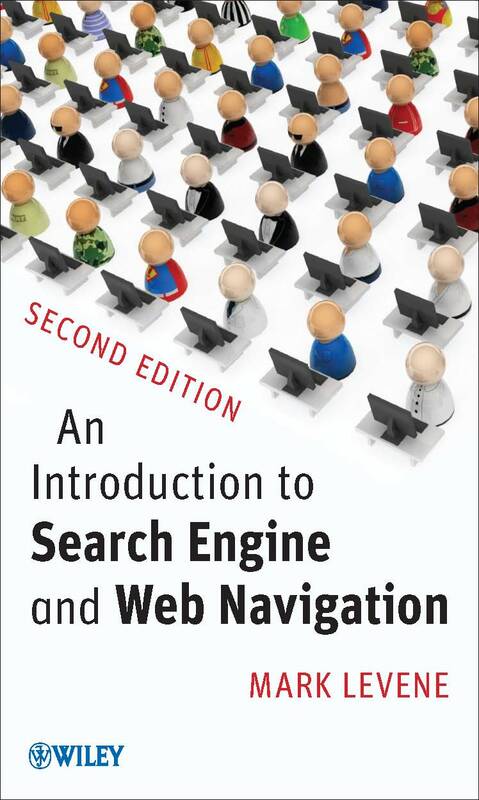 J. Borges and M. Levene A heuristic to capture longer user web navigation patterns. In Proceedings of International Conference on Electronic Commerce and Web Technologies (EC-Web). Greenwich, pp. 155-164, September 2000. J. Borges and M. Levene A fine grained heuristic to capture web navigation patterns. SIGKDD Explorations, 2, (2000), 40-50. J. Borges and M. Levene An average linear time algorithm for web data mining. International Journal of Information Technology and Decision Making, 3, (2004), 307-320. M. Levene and A. Poulovassilis Web Dynamics. Software Focus, 2, (2001), 60-67. 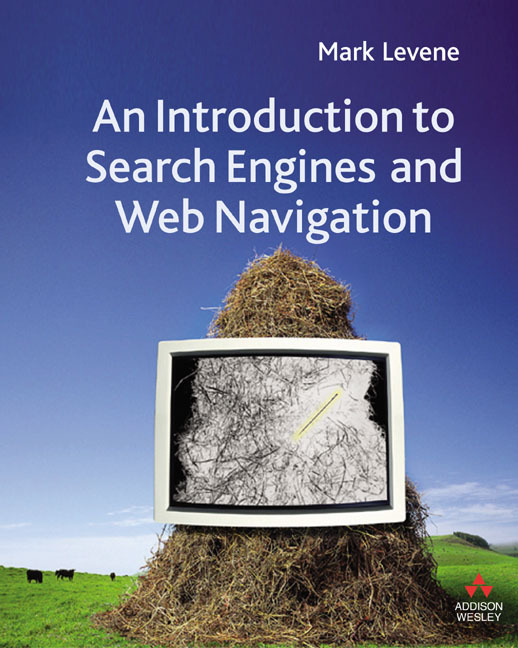 M. Levene and R. Wheeldon A Web site navigation engine. In Poster Proceedings of Tenth International World Wide Web Conference, Hong Kong, May, 2001. M. Mat-Hassan and M. Levene Can navigational assistance improve search experience: A user study. First Monday, 6, (2001). R. Wheeldon, M. Levene and N. Zin. Autodoc: A search and navigation tool for web-based program documentation. In Poster Proceedings of Eleventh International World Wide Web Conference, Hawaii, May, 2002. D. Peterson. and M. Levene. Trail records and navigational learning London Review of Education, 1, (2003), 207-216. S. de Freitas and M. Levene. Evaluating the development of wearable devices, personal data assistants and the use of other mobile devices in further and higher education institutions. JISC Technology and Standards Watch Reports, TSW 03-05, 2003. S. de Freitas and M. Levene. Spam on the internet: Is it here to stay or can it be eradicated? JISC Technology and Standards Watch Reports, TSW 04-01, 2004. R. Wheeldon and M. Levene, The Best Trail algorithm for adaptive navigation in the World-Wide-Web, Proceedings of 1st Latin American Web Congress, Santiago, Chile, November, 2003. R. Wheeldon, M. Levene and K. Keenoy, DbSurfer: A Search and Navigation Tool for Relational Databases. In Proceedings of the Annual British National Conference on Databases, Edinburgh, pp. 144-149, July 2004. B. Galitsky and M. Levene. On the economy of web links: Simulating the exchange process, First Monday, 9, (2004). M. Levene and R. Wheeldon, Navigating the World Wide Web. In Web Dynamics, Adapting to Change in Content, Size, Topology and Use, Editors M. Levene and A. Poulovassilis, pp. 117-151, 2004. B. Galitsky and M. Levene. Simulating the conflict between reputation and profitability for online rating portals. Journal of Artificial Societies and Social Simulation, 8, (2005). J. Borges and M. Levene. Ranking web pages by topology and popularity within web sites. cs.AI/0412002. World Wide Web Journal, 9, (2006), 301-316. R.M. Pampapathi, B. Mirkin and M. Levene. A suffix tree approach to text categorisation applied to spam filtering. cs.AI/0503030. Machine Learning, 65, (2006), 309-338. J. Bar-Ilan, M. Mat-Hassan and M. Levene, Methods for comparing rankings of search engine results, cs.IR/0505039. Computer Networks, Volume 50, pp. 1448-1463, (2006). J. Borges and M. Levene. Testing the predictive power of variable history web usage. Soft Computing 11, (2007), 717-727. J. Borges and M. Levene. Evaluating variable length Markov chain models for analysis of user web navigation sessions. cs.AI/0606115. IEEE Transactions on Knowledge and Data Engineering, Volume 19, 441-452 (2007). J. Bar-Ilan, K. Keenoy, E. Yaari and M. Levene. User rankings of search engine results. Journal of the American Society for Information Science Technology (JASIST), 58, (2007), 1254 - 1266. T. Fenner, M. Levene and G. Loizou. Modelling the navigation potential of a web page. arXiv:0711.3966v1 [physics.soc-ph]. Theoretical Computer Science, Volume 396, (2008), 88-96. J. Bar-Ilan, K. Keenoy, M. Levene and E. Yaari. Presentation bias is significant in determining user preference for search results - A user study. Journal of the American Society for Information Science Technology (JASIST), 60, (2009), 135-149. J. Borges and M. Levene. A comparison of scoring metrics for the predicting the next navigation step with Markov-model based systems. International Journal of Information Technology & Decision Making 11, (2010), 547-573. M. Levene and P. Wood XML structure compression. Technical Report BBKCS-02-05, School of Computer Science and Information Systems, Birkbeck College, University of London, 2002. Presented at the 2nd International Workshop on Web Dynamics. A. Poulovassilis and M. Levene A nested-graph model for the representation and manipulation of complex objects. ACM Transactions on Information Systems, 12, (1994), 35-68. M. Levene and G. Loizou A graph-based data model and its ramifications. IEEE Transactions on Knowledge and Data Engineering, 7, (1995), 809-823. M. Levene On the information content of semi-structured databases. Acta Cybernetica, 13, (1998), 257-275. M. Levene and G. Loizou Semantics of null extended nested relations. ACM Transactions on Database Systems, 18, (1993), 414-459. M. Levene and G. Loizou The nested universal relation data model. Journal of Computer and System Sciences, 49, (1994), 683-717. M. Levene A lattice view of functional dependencies in incomplete relations. Acta Cybernetica, 12, (1995), 181-207. M. Levene and G. Loizou The additivity problem for data dependencies in incomplete relational databases. In Semantics in Databases, Springer-Verlag as Lecture Notes in Computer Science, Volume 1358, 1998, pp. 136-169. M. Levene Maintaining consistency of imprecise relations. Computer Journal, 39, (1996), 114-123. M. Levene and G. Loizou A categorisation of computable database queries. Fundamenta Informaticae, 27, (1996), 319-348. M. Levene and G. Loizou The additivity problem for functional dependencies in incomplete relations. Acta Informatica, 34, (1997), 135-149. M. Levene and G. Loizou Null inclusion dependencies in relational databases. Information and Computation, 136, (1997), 67-108. M. Levene and G. Loizou Database design of incomplete relations. ACM Transactions on Database Systems, 24, (1999), 35-68. W. Ng, M. Levene and T.I. Fenner On the expressive power of the relational algebra with partially ordered domains. International Journal of Computer Mathematics, 71, (2000), pp. 53-62. M. Levene and G. Loizou Axiomatisation of functional dependencies in incomplete relations. Theoretical Computer Science, 206, (1998), 283-300. M. Levene and G. Loizou How to prevent interaction of functional and inclusion dependencies. Information Processing Letters, 71, (1999), 115-125. M. Levene and G. Loizou Guaranteeing no interaction between functional dependencies and tree-like inclusion dependencies. Theoretical Computer Science, 254, (2001), 683-690. M. Levene and G. Loizou A generalisation of entity and referential integrity in relational databases. Theoretical Informatics and Applications (RAIRO), 35, (2001), 113-128. M. Levene and M.W. Vincent Justification for inclusion dependency normal form. IEEE Transactions on Knowledge and Data Engineering, 12, (2000), 281-291. M. Levene and M.W. Vincent Recovery from inconsistency in incomplete relations. Multiple-Valued Logic an International Journal, 5, (421-442), 2000. M. Levene and G. Loizou Why is the snowflake schema a good data warehouse design? Information Systems, 28, (225-240), 2003. M. Levene and T.I. Fenner A partial analysis of minimaxing game trees with random leaf values. International Computer Chess Association Journal, 18, (1995), 20-33. M. Levene and T.I. Fenner The effect of mobility on minimaxing of game trees with random leaf values. Artificial Intelligence, 30, (2001), 1-26. M. Levene and G. Roussos. A two-player game of life. International Journal of Modern Physics C (IJMPC), 14, (2003), 195-202. M. Levene and J. Bar-Ilan, Comparing move choices of chess search engines, International Computer Games Association Journal, 28 (2005), 67-76. M. Levene and J. Bar-Ilan. Comparing typical opening move choices made by humans and chess engines. Computer Journal, 50 (2007), 567-573. Fenner T. and Levene M. Move generation with perfect hash functions. International Computer Games Association Journal, 31, (2008), 3-12. M. Levene and T. Fenner. A methodology for learning players’ styles from game records, arXiv:0904.2595v1 [cs.AI]. See Chess Style Used to Identify Players.